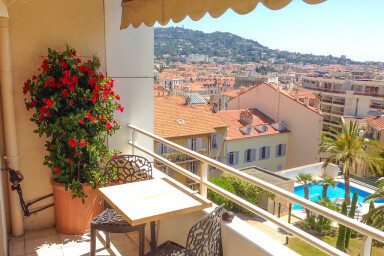 Very nice apartment with balcony overlooking Cannes and the Mediterranean. Spacious one bedroom apartment located in Residence Riviera Parc with with unobstructed views over the rooftops towards the sea and the Lérins Islands. Living room with dinner table, sofa and coffee table, TV, and doors to the terrace. Next to the living room you have a well equipped kitchen. Bedroom, bathroom and toilet is in a separate part of the apartment which has its own door from the hallway. Perfect is a family member wants to go to bed early and the others want to stay up a little longer. The bedroom is furnished with two single beds and large closets. Large glass doors that offer a wonderful view of the sea. If you arrive by car you have garage parking with access from the lift. The apartment is located in Residence Riviera Parc, a secure gated complex with a park with lots of greenery and a pool that is available to all guests. Riviera Parc is located in the heart of Cannes, just 350 meters to the Marché Forville or 10 minutes walk to the Festival Palace or the best beaches along the Croisette or to the Plage du Midi.